These days wearing a kimono is very rare. Modern Japanese people wear it on special occasions such as New Year, celebrations for the ages of 3, 5, 7, and 20, weddings, etc. On the other hand, the market of used kimonos has been expanding recently because young people are interested in wearing them. Kimono Lifestyle Consultant Kazumi Tsuda wears a kimono casually 365 days a year. Her approach on Kimono is to be informal enough to be able to walk her dog, to bike or to drive a car. Kazumi found her passion in kimono after being introduced to the Edo-style colors and patterns which are chic and elegant by her mentor. 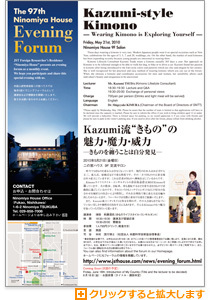 She is well recognized for her practical and easy method of wearing kimono which you can see at the forum. When she chooses a kimono and coordinates accessories for men and women, her sensibility allows each individual’s beauty and uniqueness to be uncovered. *Please apply by Wednesday, May 19th. Please be aware that the number of seats is limited so that applications will have to be declined once the capacity is reached. Please be sure to inform the office if you wish to bring children aged 12 or under. We will provide a babysitter. There is limited space for parking, so we would appreciate it if you come with friends and please be sure to park in the visitor’s parking area. If you need to drive after the forum, please refrain from drinking alcohol.